Who says you have to go out West to experience the grandeur of log home living? Prepare to be "Wowed" at Sky High Sanctuary when you enter this stunning, privately situated, four bedroom, three bath custom crafted home. The massive Canadian Logs and huge river rock wood burning fireplace provides warmth on cool mountain evenings and the soaring windows provide natural light and brings the beauty of outdoors inside. The well appointed large kitchen includes a breakfast bar for casual dining or enjoy your meals at one of the large dining room tables overlooking the beautiful North Georgia Mountains. Right off the great room is a covered porch complete with rockers to relax and take in the sights, sounds and fresh air of the area. There is a large bedroom on the main level with two Queen beds as well as a set of twins all decked out in adorable western attire. There is a full bath with a tub/shower on this level too. The King Master Suite located on the upper level has it's own private bath with double vanities and a huge walk-in tiled shower. Enjoy a delicious cup of hot morning coffee on your own private balcony or slip away from the crowd with a good book. A very large loft overlooking the great room provides another great place for relaxing as well as additional sleeping. Downstairs you will find a gorgeous rec room with foosball and pool table and a beautiful rock gas fireplace complete with comfortable seating and a flat screen TV. There are 2 more bedrooms on the terrace level, one with a king bed and 2 twin bunks and another King Bedroom providing weary cowboys/cowgirls a place to take their boots off and get some much needed shut eye. Yep, there's an indoor out-house down here too, complete with a bath/shower combo. If it's adventure you're after, take a stroll down the trail from the back yard to Carter's Lake. The private 8 acre setting boasts a concrete basketball court, horseshoes and a fire pit with seating, the perfect place to gather for roasting marshmallows and telling some ghost stories with the kids. After a full day of activities, relax in the large luxurious hot tub before settling in for a great night's sleep. I think you'll agree, this is definitely our way of "roughing it" in the mountains of North Georgia! Awesome staff, very clean cabin and all was as described! Everyone had a great time. It was hard to leave. The house was amazing. It was in I great area. Its perfect for big families. Both of the cabins exceeded our expectations! They were both so beautiful and in such gorgeous locations. The directions to both were perfect and made them easy to find. Both were stocked with plenty of clean towels, sheets and extra blankets. Our extended family hasnt gotten to visit with each other for years. We actually had the chance to get everyone together this year, and we all had a blast! Everyone was saying we would have to do this every year! THANK YOU FOR MAKING GILMORE FAMILY MEMORIES! Our stay was very nice and we had fun playing games and the fooz ball table and pool table were a plus. Sat around the fire pit one night. We were lucky enough to see three bears one afternoon, wild turkey, and frogs. We went to Ellijay for ice cream and a little shopping and loved the free wine tasting! We also found the beach on Carter Lake and enjoyed that one afternoon. Last but not least we visited the Big Foot museum. I would recommend if someone is looking for a secluded get away. Cabin was great, good location. This whole experience has been seamless. My contact at Mountain Oasis Cabin Rentals was super easy to work with and quick to respond to my messages. I go on a team retreat every year and we all said, this was the BEST cabin we have had yet. All of the rooms were clean, the table was set when we walked in the door, and it was just a very inviting atmosphere. We really enjoyed our stay! We loved our stay at Sky High Sanctuary and it was perfect for our large group. Enough places to sleep, a large meeting space, and fun amenities throughout the cabin! We definitely plan on going back next year! Rented the cabin for a weekend with friends. Super convenient since there was so many beds. The views were absolutely beautiful. It was great that there was a firepit and hot tub. We loved it! This was an amazing property, no one wanted to leave. We were already talking about going back and staying longer the next time. There was plenty of room for the kids to roam and it was a beautiful hike down to the lake. Loved every minute. There was nothing that we needed that wasn't provided. Had a blast. 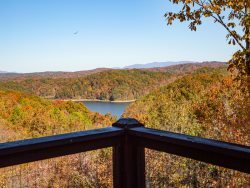 Our family stayed at Sky High Sanctuary over Thanksgiving weekend of 2016. The house far exceeded our expectations! It was immaculate and very well stocked. All of the beds were comfortable and the set up was perfect for our family. We loved the location and views! Mountain Oasis was great with booking and promptly answered any questions prior to our arrival. Our deposit was refunded in less than the promised 7 business days. All in all, a lovely home and company that was great. We will definitely be repeat customers. Thank you! We enjoyed every moment! You have exceeded our expectations. Thank you for a memorable moment! It was an awesome experience. We would like to reserve this cabin for next year as soon as we figure out date. Our family would rate our experience as a two thumbs up from the time we booked the cabin for our stay- through immediate communications with me prior to our visit- the cabin was in perfect condition when we arrived- we all relaxed and enjoyed our stay! We will be using your services again in the near future. Thank you kindly for assisting the Flanagan family with having a vacation trip we will put down in our trip book as a memorable fun time at the cabin in Georgia!